I’m staring at another great weekend. Well, as best I can. I’ll say this quick and move on to better things. I got my protein levels back to normal, had been cleared to resume marathon training this weekend, and then got REALLY sick. My blood pressure at the dr. was so low they took it 4 times with 4 different cuffs. I knew it was a sinus infection, but had no idea I had strep throat too. I’m back on the side of the road waiting to feel better and run again. I’m not giving up on this marathon. I’m just not. I’ve got 8 weeks to work up to 20 miles. I was at 15. I’ve found a good recovery training program that I’ll adjust to my current training. I may walk a large portion of this race. In fact, I may start off with a run/walk program. Finishing is so important, but getting rhabdo again is out of the question. Since it’s been a while (years) since I’ve had strep throat, I forgot how bad my throat hurts. It hurts to swallow, talk, eat, or drink. I wanted a strong cup of morning coffee and oatmeal, but that would be like a boiling hot brillo pad on my throat. No way. As I was cruising the national food calendar, I happened to notice today is National Frappe Day. I had to google it. I did. I’m so sorry, frappe worshippers. I knew it was something cold and coffee but wasn’t sure what else was in it. I ignore those signs at Starbucks. I love my coffee hot and not swimming in fat. Now that I’ve made one, I may have to indulge. Basically, a frappe is anything cold, crushed, and in a glass. Frappes do not have to be coffee based. They can be fruit based, even vegetable based. As long as it’s cold and slushy with ice, it’s a frappe. But I wanted coffee. cold strong coffee. If you want yours with some extra sweet, sweeten the coffee while hot, then put in fridge to get cold. whipped cream-I made my own by chilling evaporated milk and whipping it in Lola for about 3 minutes. It had excellent texture but it has to be ice cold. 1. If you’re doing your own whipped topping, start whipping in the mixer. If you’re using can or carton, have it ready to scoop. 2. 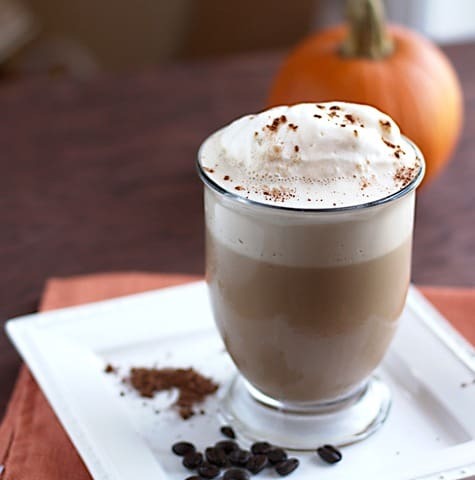 In a blender, combine 1 1/2 cups of ice cold coffee, 1 cup of chocolate milk, 1/2 teaspoon of pumpkin pie spice and few ice cubes. Blend. 3. Pour mocha mixture in a class. You will start to see a foam at the top. That’s good. Don’t stir it away. Scoop whipped cream on top. Sprinkle with pumpkin pie spice. Previous Post: « Farmer’s Market finds. This looks absolutely delicious! What a great recipe!